Star Wars RP Research: Hutt Space! You are here: Home / SWTOR / News / Star Wars RP Research: Hutt Space! Immersive virtual settings are evolving to become new “spaces of life”. Humans inhabit these different virtual worlds through their avatars, and tend to gather into communities. However, the behavioral factors underlying the cognitive process of immersion in virtual worlds are still far to be understood. 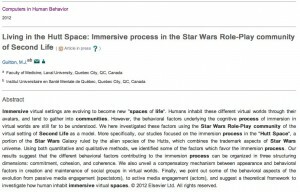 We here investigated these factors using the Star Wars Role-Play community of the virtual setting of Second Life as a model. More specifically, our studies focused on the immersion process in the “Hutt Space”, a portion of the Star Wars Galaxy ruled by the alien species of the Hutts, which combines the trademark aspects of Star Warsuniverse. Using both quantitative and qualitative methods, we identified some of the factors which favor the immersion process. Our results suggest that the different behavioral factors contributing to the immersion process can be organized in three structuring dimensions: commitment, cohesion, and coherence. We also unveil a compensatory mechanism between appearance and behavioral factors in creation and maintenance of social groups in virtual worlds. Finally, we point out some of the behavioral aspects of the evolution from passive media engagement (spectators), to active media engagement (actors), and suggest a theoretical framework to investigate how human inhabit immersive virtual spaces. My semi-educated guess is that research studies are already underway in relation to SWTOR. Anyone want to suggest what the research topics will be? same thing for light alignment.